Hi, Jubilee or often called Juju, arrived at home in October 2015 at the age of 3 months. She's so adorable and smart like all the cotons are. We live in France and Juju understands French & Spanish spoken. She is my lovely baby girl that I did a Facebook page to share our forever friendship. 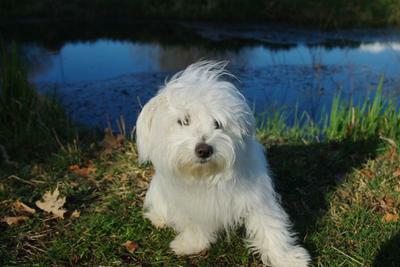 Yes I am a pure coton de Tuléar puppy. You are just adorable Jubilee! Charlie and I joined your facebook page, and Charlie sent you a picture of himself. Take care and keep on posting those cute pix! So nice to meet you JuJu. What a smart girl to be bilingual but then you are a coton aren't you? You are so smart and clever. Will have to check out your facebook page....Tell mommy thanks for posting such a beautiful pic of you.